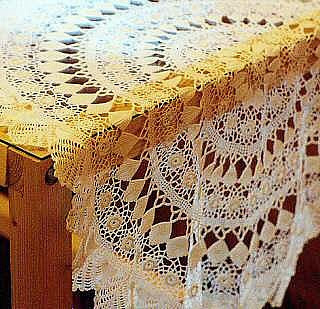 Besides the delicate lace they produce, the women of São Jorge are responsible for one of the most characteristic forms of handicraft in the Azores - the home-made counterpanes which are a patchwork of squares and rectangles, in which red and yellow are the prevailing colours, covering the whole cloth. These colourful counterpanes are laboriously made on crude wooden looms using ancestral techniques. Made of warm wool to keep out the cold of winter nights, they add a colourful and cheerful note to the simple, whitewashed walls of the houses on São Jorge.